Grand pianos were being carried from one place to another all the time. You could always hear someone tuning one, since the classical musicians still have high pitch standards even if instrument care is a bit different than seen in classical music halls! If you haven’t yet visited the Baltic states, you should. The drive south from Tallinn on road E67 through Estonia, Latvia and Lithuania is beautiful, and next to it are some very nice places to visit. In addition to this, if you have not yet been to the “alternative chamber music festival” SanSuSi, you definitely should. It was like an event from my dreams. Armands, Uldis, Mara and all the others organizing the festival in the countryside of Latvia, just next to the Lithuanian border have definitely understood something about life and how it should be enjoyed. The whole festival is built around a bed&breakfast accommodation house and its large yard surrounded by a forest. 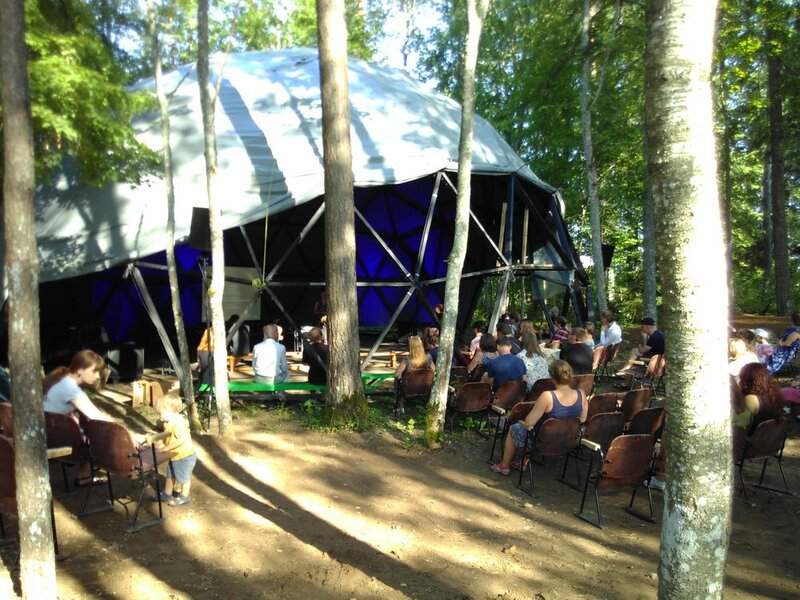 Within the forest there are several dome-structures built to act as stages, there was a large tiipii-like bar-hut, the audience was camping on the grass, and for the children there was a slackline, large trampoline and a waterhose to keep them occupied (it seemed to work very well). Audience listening to a concert at the second dome stage. The program went on all through the night, even though we had to give up a bit after midnight to play on the next day. I was walking to sleep after a piano battle in the woods (spectacular) while someone was reciting poetry in Latvian lit by some lights in the dark woods. People were gathered close to each other around fireplaces. The next night the nature provided its own surprise performance with a spectacular thunderstorm with rain pouring down from the sky like from a huge bucket. Uldis thought this was something he would rather not have wanted, but for me it was one of the best shows to watch from under a shelter filled with patient and very weather-adaptable audience members. Here we spent some time with our groupie Oskar, and the Hiljaisuus-festival crew Joonas and Henna, who will also be included in the forest team. We were hosted 20 km away in a cottage by a very nice Latvian couple, and enjoyed a lot the breakfast moments we shared with them discussing the Baltic and Nordic cultures, tasting some local treats and drinking coffee in an apparently common Lativian way; just placing the coffee grains in your cup and pouring hot water over. A bit like French press but no press included, convenient! Some very memorable performances were an modern accordeon concert by a Spanish accordeonist (she had a great answer to the question “is the accordeon in your opinion the best instrument?”. She said something like “I don’t know, not really, but it’s now the one I have spent the most time playing so I continue with it”), a grand piano concert of Chopin, a dance performance duo where the men just twirled around each other in continuous spirals for an hour and some electro/Balkan/dj/trad trio of Marzi Nyman and his newfound music collegues under the tiipii with disco lights.